A coalition led by the State of New York that included San Francisco, five other cities, 17 states, the District of Columbia and the U.S. Conference of Mayors took the Trump administration to court on April 3, 2018 to prevent the inclusion of a citizenship question on the 2020 U.S. census that would undermine the census’ accuracy. Later, four other cities, four counties and another state joined the coalition. A number of nonprofits also sued the Trump administration over the same issue. The last time a citizenship question appeared on the U.S. census was 1950. Since at least 1980, the Census Bureau, under both Democratic and Republican administrations, has taken the position that inquiries about citizenship on the census would jeopardize the overall accuracy of the population count, including undercounting legal immigrants in the United States. The census is used to allocate seats in the House of Representatives, determine the number of electors to the Electoral College, draw state and local electoral districts, and distribute hundreds of billions of dollars in federal grant funds to states, local governments and other grantees. Federal researchers found that in fiscal year 2015 more than 130 programs used Census Bureau data to distribute more than $675 billion in funds for things like Medicaid, transportation projects, Temporary Assistance for Needy Families and the National School Lunch Program. Plaintiffs in the lawsuit are the cities of San Francisco, New York, Chicago, Providence, Philadelphia, Seattle, Phoenix, Central Falls, Columbus and Pittsburgh; counties of Cameron, El Paso, Hidalgo and Monterey; the states of New York, Colorado, Connecticut, Delaware, Illinois, Iowa, Maryland, Massachusetts, Minnesota, New Jersey, New Mexico, North Carolina, Oregon, Pennsylvania, Rhode Island, Vermont, Virginia and Washington; the District of Columbia; and the bipartisan U.S. Conference of Mayors. The case is: State of New York et al. v. U.S. Department of Commerce et al., U.S. District Court for the Southern District of New York case No. 1:18-cv-02921, filed April 3, 2018. 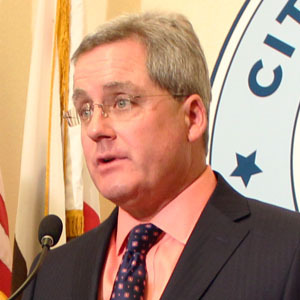 Additional documentation from the case is available on the City Attorney’s website at: sfcityattorney.org.